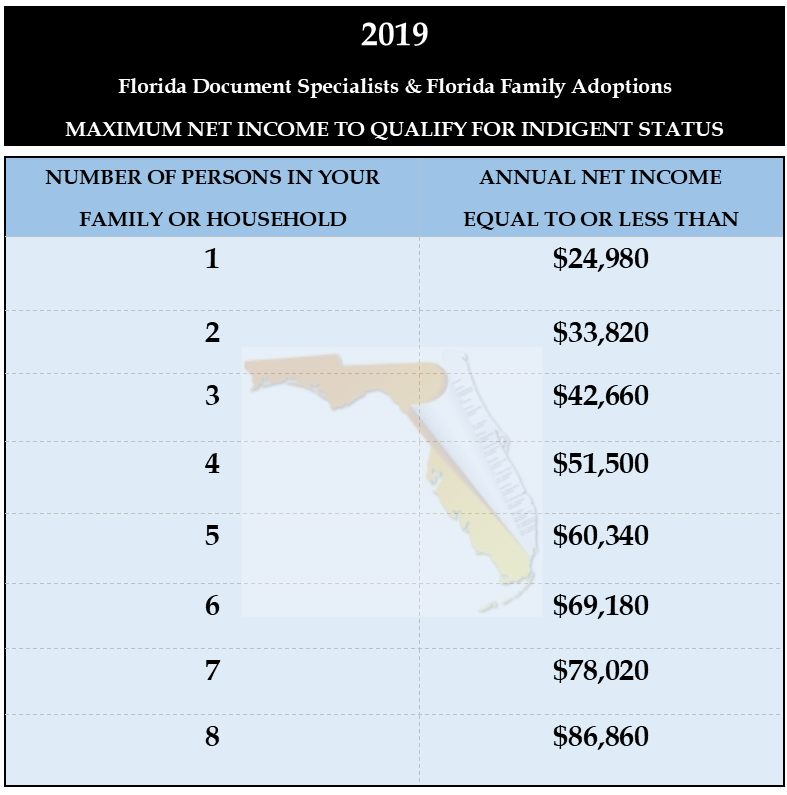 Due to the very nature of our business, we help many Florida families that have a limited income. Many are surprised to learn that Florida law directs the Clerk of the Court to waive the cost of filing their case if certain criteria are met. The rules governing the determination of civil indigent status is set forth in Florida Statute 57.082. HOW DO I KNOW IF I QUALIFY TO HAVE MY FILING FEES WAIVED? The clerk of court considers several factors when deciding whether or not to approve your application. The first is your net income. Net income is the total of your salary and wages, minus authorized deductions required by law, including court-ordered support payments. BESIDES MY SALARY AND WAGES, WHAT OTHER TYPES OF NET INCOME DO I HAVE TO REPORT? You must declare all of your other income, including, but not limited to, social security benefits, union funds, veterans’ benefits, workers’ compensation, other regular support from absent family members, public or private employee pensions, reemployment assistance or unemployment compensation, dividends, interest, rent, trusts, and gifts. HOW CAN I FIND OUT IF MY INCOME IS LOW ENOUGH TO QUALIFY FOR A FILING FEE WAIVER? Refer to the below chart. Your income must be at or below the amount listed in the row next to the size of your family. These numbers are based on 200% of the 2019 federal poverty guidelines prescribed for the size of the household of the applicant by the United States Department of Health and Human Services. SO IF MY INCOME IS AT OR BELOW THE AMOUNT IN THE CHART, I GET APPROVED? Not so fast. Besides your net income, the clerk of court will look at your assets and how much money you have. As a rule, if you own or have interest in property (other than your homestead), or have money or liquid assets in excess of $2500, you might not qualify. For example, if you are unemployed but have $5000 in your savings account, you’re probably not going to qualify. The equity that you have in your vehicle is also a factor. We can help you estimate the fair market value of your vehicles using publicly available online tools. If you own one vehicle with $5500 in equity, you probably won’t qualify. WHAT IF MY SPOUSE IS A CO-PETITIONER ON MY ADOPTION CASE? You and your spouse must both submit separate applications in order for the clerk of court to determine your eligibility for a filing fee waiver. CAN I FIND OUT BEFORE I FILE MY CASE WHETHER OR NOT MY APPLICATION WILL BE APPROVED? Unfortunately, no. Your application is filed along with your initial filing, and the clerk makes the determination at that time. You the right to appeal the clerk’s decision if you wish. IF I GET APPROVED, ARE THERE OTHER FEES AND COSTS THAT ARE WAIVED? Yes and no. If your Florida Application for Civil Indigent Status if approved, you won’t have to pay $10 each for a summons. If you are serving a party in Florida, the county sheriff will waive the $40 fee they charge for service of process. There are a few Florida sheriffs that do not serve non-enforceable papers such as family law petitions, etc. and make you seek out a private process server. Your wavier will not be honored by them. If we are helping you serve parties out of state, we have to call the sheriff in the county where the party is being served and ask them if they will honor your Florida indigent status. Some will, and some won’t. We won’t know until we call. We do all of this leg work for you at no additional charge. If you have to place a legal notice in a newspaper, their is a good chance that the clerk of court will simply hang the “Notice of Action” on the court’s bulletin boards for 4-weeks instead of making you pay for the publication. If you case goes to family mediation, your approved indigent status will probably cover the cost, unless you opt for private mediation. WHERE DO I FIND THE APPLICATION FOR CIVIL INDIGENT STATUS FORMS FOR MY COUNTY, AND HOW DO I FILL THEM OUT? Good news. We have all of the latest forms for this and most anything else that you need to accomplish. After you complete our simple online filing fee wavier questionnaire, we’ll have enough information to complete these applications for you and have them ready to review and sign before you file your case.